Walking up from the Banff townsite to the Banff Centre for Art and Creativity one evening, I saw movement on the path ahead of me. It was going on six-thirty p.m., and this far north and surrounded by mountains, it was dark. During our orientation session, we’d been told to “be aware of bears,” which, we were told, should be hibernating by now, “but some might not be.” I was dressed in black – black jeans, black sweater, even black socks and toque – except for my outer jacket, which was a soft, fawn colour. In the dark, downwind, and from the point of view of a near-sighted grizzly, it occurred to me I could have been mistaken for a mule deer. I stepped off the path into the shade of a tall evergreen tree and waited. 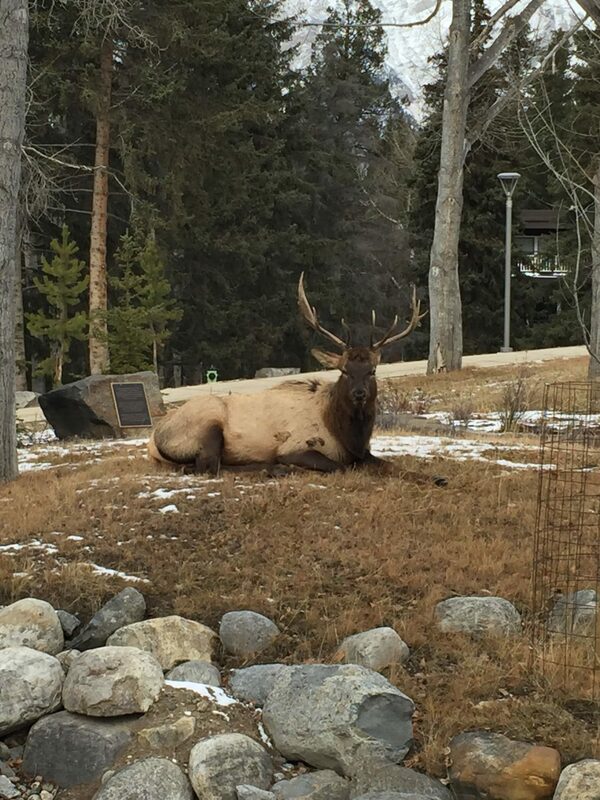 After a few seconds, a huge elk appeared on the path, sauntering down from the Banff Centre, moving so slowly towards town it was as though he’d been sent down to scare townspeople but wished he didn’t have to go. The path was iced over and slippery, so perhaps he was just being careful of his footing. Tall as a horse, dark hair on his front- and hindquarters and a grizzled, greyish-white on his back and around his belly, he had the largest array of antlers I’d seen, at least six feet across, or so it seemed on the four-foot-wide path. When he saw me standing under the tree, he moved slightly to the far side of the path, like a transport trailer on the Trans-Canada making room for me to pass in my little Toyota Prius. Maybe he thought I was a mule deer. I stepped back onto the path and, walking as slowly as he was, continued up the hill. I passed him close enough to touch his antlers, but it was too dark for me to see into his eyes, or even whether he was looking sideways me at me, which was a pity, I thought, because I was reminded of John Berger’s essay in Ways of Seeing, in which he visits the London Zoo and writes about meeting the eyes of a caged gorilla. He suggests that the real purpose of zoos is not that we can go there to see wild animals, but that we can go to be seen by wild animals. The experience of that gorilla looking into Berger’s eyes is so profoundly thrilling to Berger – he doesn’t presume to guess what it meant to the ape – that he is certain it took on a primal, ancestral significance for humanity. To be seen by a wild animal, to meet its gaze, is both to share its existence and to encounter an equal. Its wildness animates our own forgotten, inner wildness, stirring that part of us that Freud said could lead to a psychotic break. I am in Banff to teach a writing workshop, part of the Writers Emerging Intensive, the new name for the Writing with Style program. There are thirty-two students taking ten-day workshops in creative nonfiction (me), poetry (Elizabeth Philips), the novel (Madeleine Thien), and the short story (Saleema Nawaz). After my encounter with the elk, as we gathered in the Writers’ Lounge in Lloyd Hall for our regular evening get-together, someone asked our moderator, Meghan Power, if it was safe to hike the trails above the Banff Centre, in particular up Tunnel Mountain. Were we likely to encounter wildlife? A few years ago, when Merilyn and I were writers-in-residence in Whistler, B.C., we were given a house on Alta Lake, which we could reach only by parking our car half a kilometre away and walking in. It was November then, too. We learned that in fact at this time of year the bears actually come down from the mountains to fatten up before hibernation. There is more to eat down here in the valleys. Every day, when we walked out to our car, we passed a fairly soporific female black bear sitting under a wild apple tree, gorging on windfalls. I didn’t mention this to our Banff cohort, maybe Alberta bears behave differently. A decade or so ago, when I was writing The Nature of Coyotes, I came to Banff to spend a week in the park going to coyote den-sites with the park ranger. At one site, situated close to the golf course attached to the Banff Springs Hotel, we found a cache of some twenty golf balls, which the adult coyotes had evidently carried back to the den for the pups to play with. Unless I was carrying a pocketful of golf balls, I thought, I didn’t think the coyotes would bother me. One afternoon during that trip, when I was driving along a side road, I came upon a female coyote sitting on her haunches beside the pavement. I slowed down and stopped, and saw that she was sitting beside the body of her mate, a big, dark-haired, beautiful animal that had evidently been hit by a car. He was slightly farther down in the ditch, which is why I hadn’t seen him at first. I got out of the car and walked to within a few feet of the female. She didn’t move. She didn’t do any of the things a domestic dog might have done; she didn’t shuffle her paws, or wag her tail, or whine, or stick out her tongue and pant. She just sat there and looked at me, composed, indifferent, withdrawn into herself. But our eyes met. There is no human word for what I saw in hers. For all she knew it might have been my car that had killed her mate, it was certainly my kind who had killed countless of hers, but she was far from afraid, or even angry. She simply wasn’t going to move. I wasn’t important enough to her to make her leave her mate. But having read John Berger’s essay, I wondered what she saw in my eyes. I hope it was grief. I hope she saw an apology. I stood still for a long time, holding her gaze. She looked away from time to time, then back at me, as though surprised I was still there. I got the message. I returned to my car and left her, aware that I had experienced one of the most deeply emotional moments of my life. A few days later, on my way to a morning workshop, another male elk was sitting in the grass outside the Kinnear Building. I stopped and looked at him, and he looked back. As with the female coyote, and the black bear on Alta Lake, his unconcern at my presence was a kind of relief to me. Not because it made me feel safe, but because it made me feel insignificant.